Amid rising rates, investing in a broad range of fixed income asset classes with varying levels of interest rate risk may help buoy a portfolio’s returns while also providing a competitive level of income. 2 Bloomberg, Q4 represents the period from September 30–October 11. Investment grade bonds represented by the Bloomberg Barclays U.S. Aggregate Bond Index. Corporate bonds represented by the ICE BofAML U.S. Corporate Master Index. Senior secured loans represented by the Credit Suisse Leveraged Loan Index. 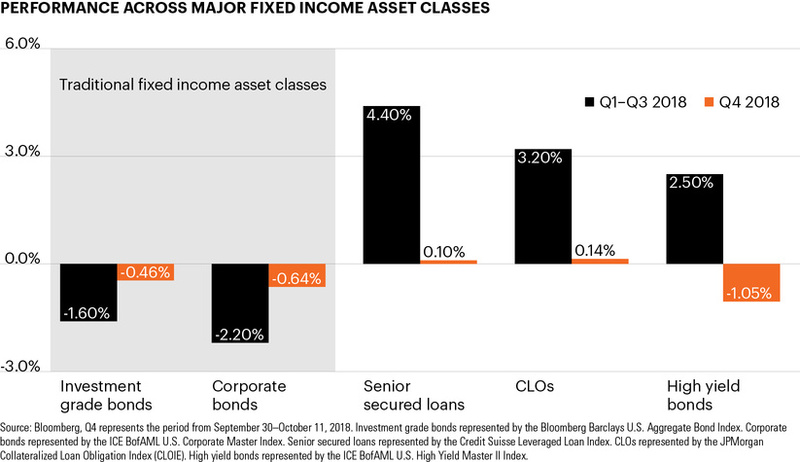 CLOs represented by the JPMorgan CLOIE. High yield bonds represented by the ICE BofAML U.S. High Yield Master II Index.